Join us on Facebook or Email us! Welcome to Sub-Aquatic Sports & Service! We've spent the last 39 years teaching scuba classes, selling quality scuba equipment and offering dive trips all around the world. If you're ready for a new adventure, come join the fun! Learn Scuba Before Your Vacation to Warmer Climates. Scuba Certification Course When you're ready to take the plunge to become a certified diver, this is the class you need. Advance Diver Class Learn and improve on 6 different types of dive skills like night dives, deep dives, underwater compass work, better buoyancy, etc. Dry Suit Too cold to dive? Nonsense! Learn to use a dry suit and dive year around. Master Diver Certification As the name applies, greatly expand your knowledge and skills in the sport. Refresher Course Feeling a little rusty? Take this semi-private class for only $99. Life's an Adventure, Go Live it! Don't know what to buy your diver? Gift Cards are sure to please. They are available in any dollar value by calling SASS at 269-968-8551 or buy one for a set value now! There's free standard shipping for any purchase under $50 and free Priority USPS for any purchase over $50. Every Wednesday from mid-May thru mid September, we offer FREE local lake dives. This is a great way to gain proficiency, meet new dive buddies and simply have fun. Come join us! Watch this Video to Learn More!! 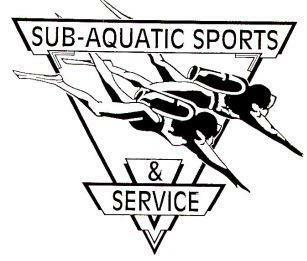 Sub-Aquatic Sports & Service Ltd.